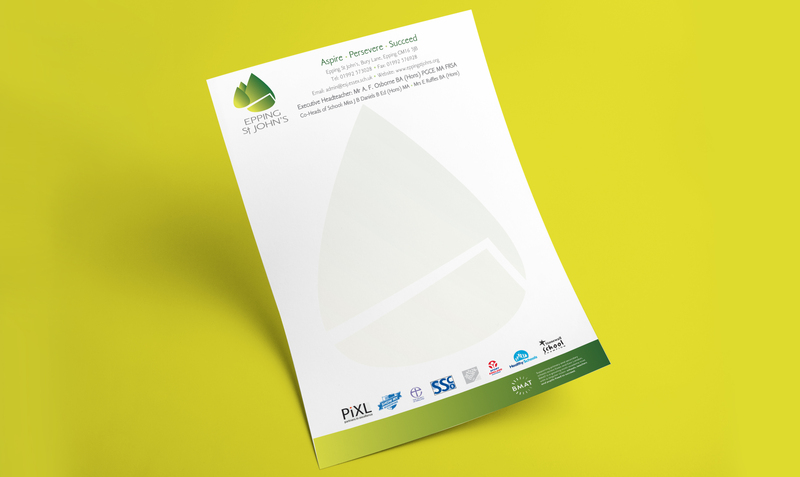 When we got the call from Burnt Mill Academy Trust (BMAT), a schools trust based in Essex, The leaders of the Trust knew they had a brand problem. The difficulty was, they couldn’t quite put their finger on what the problem was. ‘Our website looks so unprofessional’ and ‘We don’t really know what our USP is’ were the closest they could come to articulating this. (1) Why does BMAT matter to the schools in the network? (2) Why should prospective teachers choose BMAT for their careers? (3) How can BMAT and its schools be more clearly associated? Armed with the knowledge of the real issues in play, we were ready to start. Through spending time with the CEO and her team, it quickly became apparent the external brand had failed to keep up with the organisation itself. What was once a small multi-academy trust in Harlow, Essex, had grown into an ambitious, highly-regarded network of 12 schools spread across Essex and East London. The problem was the brand spoke of an organisation altogether more ordinary, more colloquial. It was time for the brand to play catch-up. 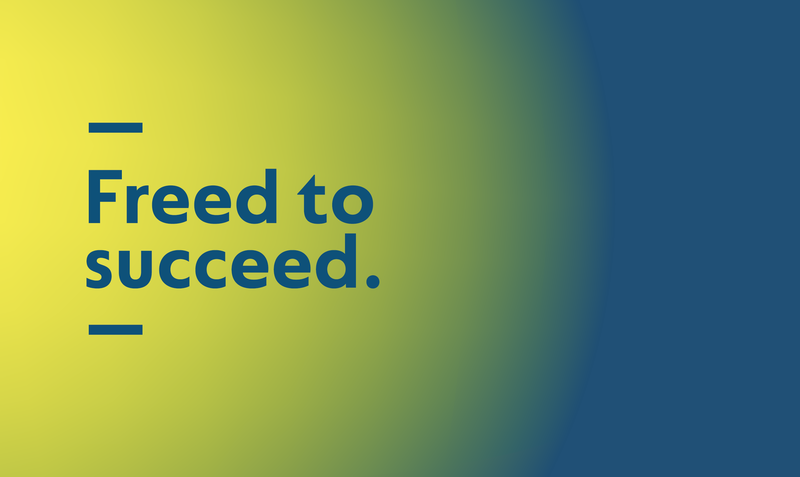 The first hurdle to overcome was the most obvious one – the name. Everyone agreed the name ‘Burnt Mill Academy Trust’ was no longer suitable to a growing network that reached far beyond the confines of the first school after which it was named. Our suggestion was simple and affordable – adopt the moniker (BMAT) and allow this to move from acronym to official name. 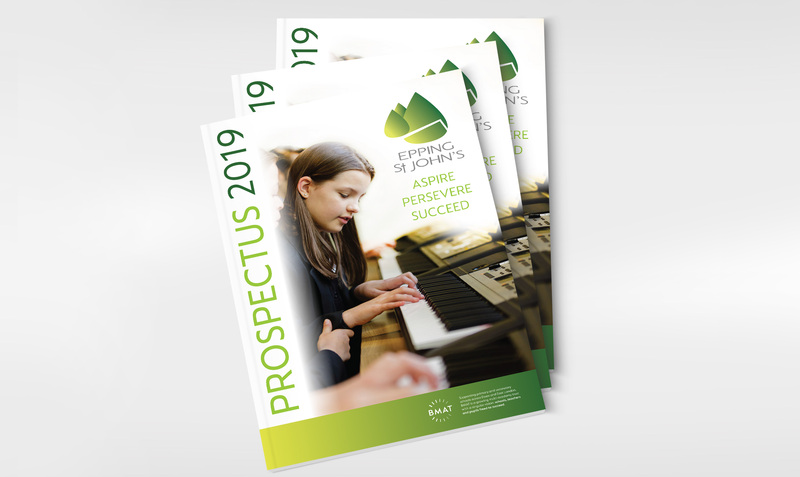 The second big hurdle we had to overcome was the propensity for BMAT to do what most brands in education do – stand for everything. In the swirl of their vision, mission, values and motto were many words and several competing ideas. 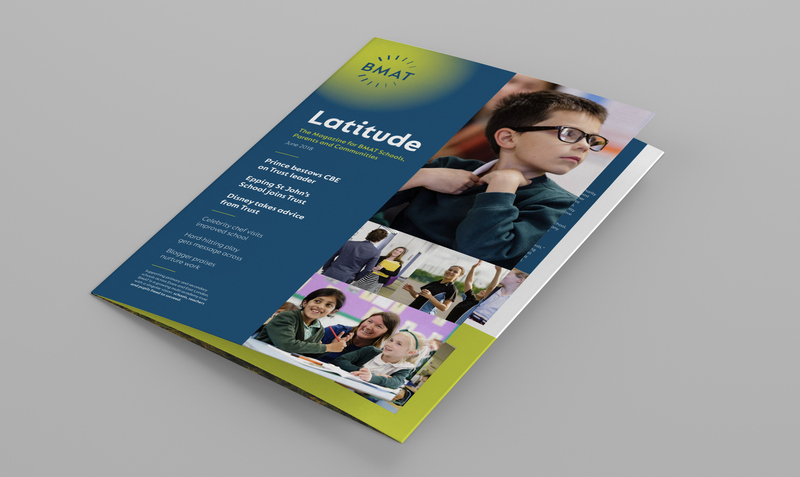 Using our brand methodology, that included workshops with senior leaders, interviews with staff and research of the peer landscape, it became apparent that BMAT could stand for something in particular – something that not every state school network would be prepared to stand for: FREEDOM. At BMAT, we believe in freedom. In lifting the ceiling off our children. In letting our teachers truly teach. In letting our schools express who they are. a place where schools, teachers and children are freed to succeed. With a ‘new’ name and big thought everyone could get behind, the challenge was finding a look and feel that would invoke the same levels of enthusiasm. We took our inspiration from the idea of BMAT being the ones that set their sights on the horizon, on pushing into unknown possibilities. This kernel of inspiration birthed ‘the glow’, a graphic device that represented the sun and became the focal point of the new look and feel. This was accompanied by a strong, open-feeling typeface and a colour palette that was distinctive but not overbearing. Similarly, the logo we settled for was deliberately ‘restrained’ – reflecting the rays of the sun and capturing a sense of positive energy and possibility at the heart of the brand. Ensuring the BMAT brand did not ‘dominate’ was a key concern. We knew that part of answering the ‘How are the Trust and schools associated with each other?’ question would have to be visual. 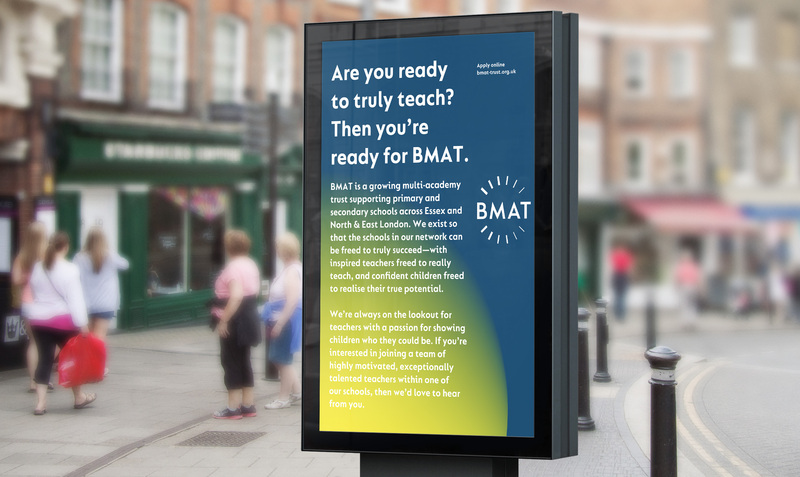 For this reason, we ensured both the logo and primary colour for the new BMAT brand would not overpower the local school brands when they interacted. 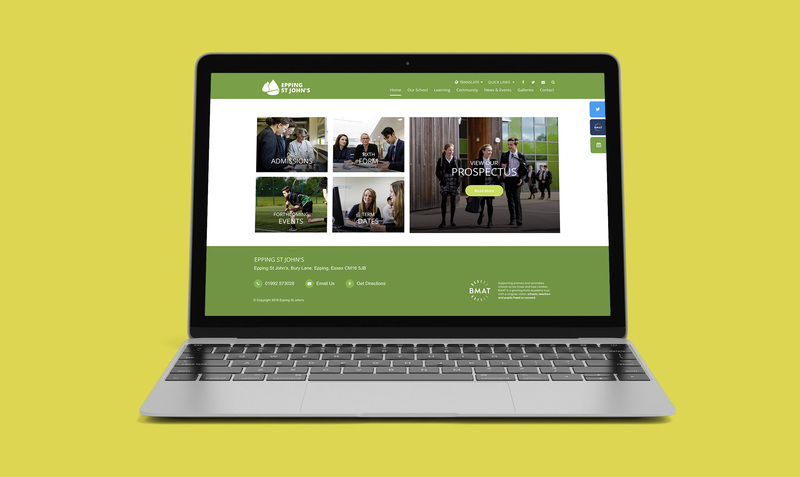 We also worked with the senior team – including Headteachers from local schools – on guidelines for how the brands should interact, with the overall thrust being that BMAT should be considered a ‘trust mark’ for local schools. 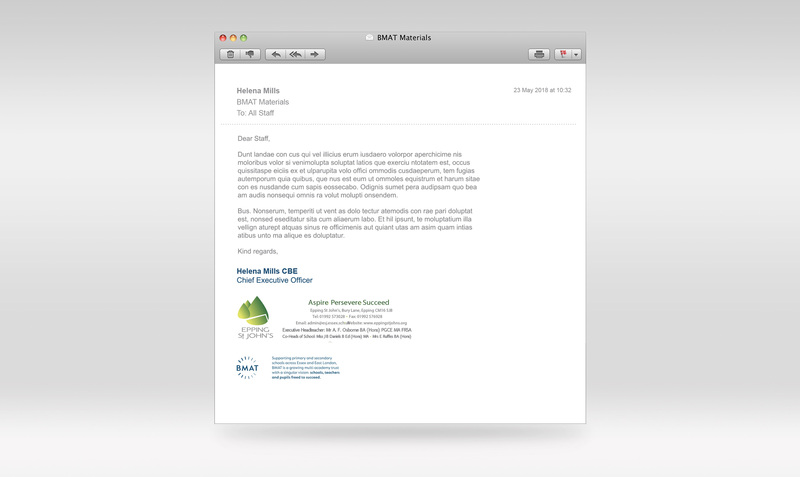 It was there for local schools to communicate ‘We are part of something bigger – we are part of BMAT’. © 2017 Alistair Bullen & Associates Ltd. Registered in England No. 02480313.